Full of excitement and always ready for adventure, kids can be a bit of a handful. This is especially true during school holidays and weekends, when there's no homework and plenty of time to explore. Obviously, you don't want to plonk them down in front of the TV too often, but if you're saving money you might feel like there's no other option. If you're wondering how to save money and still have a fulfilling time with your children, worry no more. There are lots of great ways to have fun with the little ones without blowing the budget, or the DVD player. You can still treat them to a few big days out by keeping track of your finances using our free budget planner, but for the rest of the month, these money saving activities will do just fine. Baking with the kids is fun. While it can be a bit messy, at the end there are always plenty of tasty treats to eat. This ticks all the boxes for a pretty entertaining afternoon. As well as having fun baking cookies, cupcakes, and brownies, kids will also be learning more practical skills that they can carry with them into later life. Instead of sweet treats, you could also try making home-made pizzas. Halve some English muffins, top them with tomato sauce, and let the kids decorate them with bowls of veggies and cheese. It's not exactly the great outdoors, but there's still something magical about sleeping in a tent: even if it is in the back garden. As a bonus, mum and dad get a quiet night to themselves while the kids are out sleeping under the stars. If the weather's bad, you can set up a ‘tent' in the living room (or bedroom) by pinning up old sheets and popping a couple of sleeping bags inside. You can't have a campfire, but you can toast some marshmallows under the grill and sit around telling ghost stories. Get some fresh air and exercise by heading into your nearest woods and going for a ramble. There's lots to see and do in the woods for young adventurers, whether it's splashing through rivers or dangling from tree branches. 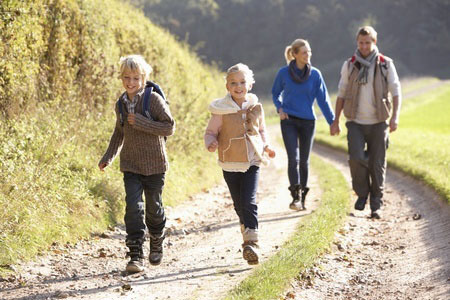 You can make the walk more fun for the kids by holding a scavenger hunt. Give them a list of things to spot such as pinecones, squirrels, and wildflowers, and see who can tick everything off first. Take a picnic and make a day of it. When you're budgeting, it's always a good idea to keep an eye out for special offers. This also applies to finding things to do with kids. Local councils often hold free events and festivals geared towards families and children during the holidays, so make sure you regularly check their website. Check local papers and event listing websites, too. This is a good way to find unique activities like arts and crafts, days at the local gallery, or storytelling afternoons at the library.